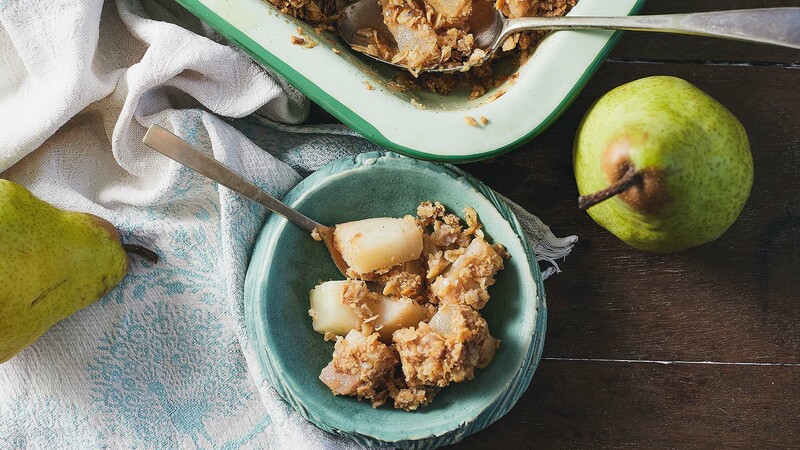 Nothing beats the smell of this delicious fruit crumble baking. Once you understand how to make a crumble, you can do this with any fruit that happens to be in season, and experiment with flavours like nutmeg or star anise. 2. Prepare all of the ingredients based on the instructions in the ingredients list. Remember to put a damp tea towel under your chopping board to stop it from slipping. 3. Place the water, lemon juice and caster sugar in the saucepan. Bring to a simmer. 4. Drop the pears into the syrup. 5. Put the lid on the saucepan. Turn the heat down to low, and simmer for 7–10 minutes, until tender. 6. Drain the poaching juice off into a bowl (you can use this for future dishes - just store, label and freeze it). Place the fruit in the bottom of the baking dish. 7. To make the topping, mix the sugar, baking powder and ground ginger or cinnamon together in a bowl. 8. In another bowl, add the flour and oats. Crumble the butter into the mix and use your fingers to squeeze the ingredients together and form pea-sized pieces. 9. Toss the flour mixture in with the sugar mixture. 10. Spread the topping over the fruit. 11. Bake for 30 minutes or until topping is golden brown and bubbling at the edges.